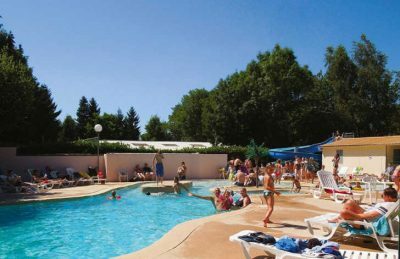 Camping Les Etangs Fleuris is a 3 star campsite located in Touquin in the Paris region of France. Camping Les Etangs Fleuris is a lovely small, rural campsite that is located in a small woodland in the heart of the countryside around 50 minutes drive from the centre of Paris. The campsite lies within approximately 10 hectares of grounds and is perfect for those looking for a peaceful campsite, where they can relax and have fun whilst still being within close proximity to the capital and all it has to offer. With the sights and sounds of Paris being so close you may not require a lot of different activities to keep you busy but if really want to spend time on-site you’ll find a great range of things to do. Those looking to visit Disneyland Paris will find that the campsite is perfectly located for a trip to the magical theme park. Just 25 minutes drive and you’ll be at the most popular and spectacular theme park in Europe. Rub shoulders with some of your favourite Disney characters, enjoy the rides or just watch some of the fantastic parades, the choice is yours. Back on-site at the end of a long day exploring why not take a dip in the campsite’s swimming pool. A lovely outdoor pool, slide and plenty of sun terrace awaits you at Camping Etangs Fleuris to ensure your stay is a pleasurable one. Camping Les Etangs Fleuris offers a comprehensive selection of activities and facilities on site and also nearby to ensure you have a fantastic family holiday. On-site activities at Camping Les Etangs Fleuris include trampolines, multisports pitch, football, volleyball, basketball, table tennis, fishing, mini golf, playground, boules and cycle hire. Facilities available at Camping Les Etangs Fleuris include WIFI, takeaway, bar, games room, animation team, washers and dryers. Accommodation at Camping Les Etangs Fleuris campsite includes a range of 2 and 3 bedroom mobile homes and tents that are available from Suncamp. Click the button below to book your camping holiday in France with our travel partner, Suncamp.